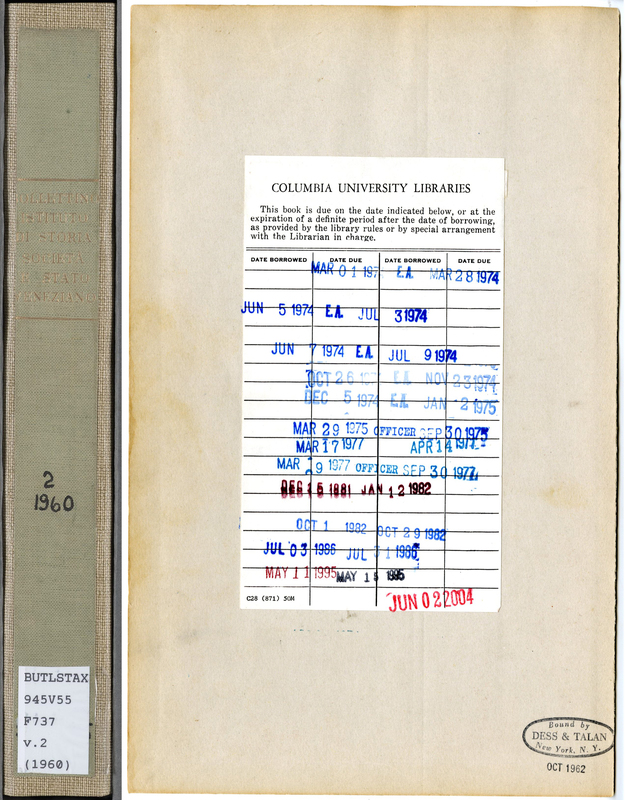 I work in the Binding & Shelf Preparation Department (part of PDCD) in the Columbia University Libraries system. The great thing about working in this department is seeing books come in for the very first time as well as some of the oldest books that continue to circulate regularly in our collection. I learned to appreciate how important it was to care for books at an early age. I went to grade school in a small section of NYC’s Lower East Side known as Alphabet City during the 1980’s. It’s the area encompassing everything between Houston and 14th Streets that is east of Avenue A. It was first populated by Eastern European, Irish, and Italian immigrants in the late 19th and early-mid 20th centuries, but transformed in the 1960’s as thousands of Puerto Ricans migrated to the area. By the time I went to school it was mostly a Puerto Rican, Dominican, and African American neighborhood. The first day of school is scary for most children, but New York City during the 1980’s was ravaged by a heroin epidemic in the first half of the decade and crack cocaine in the second, so it was especially scary for a shy 6 year old like me. It was all too common for us to witness drug deals just outside the fence of our school’s playground during recess or to find evidence of drug use left by the addicts who used the park at night. My only friend and companion until then had been my grandmother who accompanied me to school that first day, so leaving her comfort and protection to be left alone in this place seemed terrifying. Thankfully, my first grade teacher was a kind woman with a shock of gray hair and nurturing demeanor who helped ease my anxiety as she looked like someone’s grandmother and would adequately fill in for my own—at least until 3pm. That first day she lined us up, in alphabetical order by last name, to get a textbook from the stacks of used books on her desk. Some were in really poor condition while others had obviously been well cared for with makeshift book covers fashioned out of brown paper bags still covering their boards. It was our book to use for the year so I was happy to have a last name that started with “C”, which put me near the front of the line. I took one with the cleanest-looking paper to my assigned seat and waited impatiently for permission to open it and write my name inside. There was an area with columns and lines for the student’s information, like “name”, “year used”, and “condition issued/received” stamped on the front endsheet by Holt with room for nine or ten names. My book had been used so many times that the names of previous students extended well past the final line with several written neatly in line under the box, so I added mine under the last name. Somehow writing my name made it feel official, like signing a contract: I was a student—a real student with a book of my own! It was empowering, but also renewed my anxiety as I suddenly felt the gravity of an endeavor that would last at least double the amount of time I had been alive. Then, I looked at the list of names and a few names down one jumped out at me, the name of my uncle Robert who had Ms. Gladman for first grade 12 years earlier and learned how to read using the same book. Thanks to that experience whenever I leaf through an old book I think about the hands it passed through before resting in my own—especially when holding an old library book. Copious annotations from previous readers and stacks of circulation slips piled in back that provide a record of its life, like the rings of the tree whose pulp was pressed to form its pages, always makes me ponder its history. That experience also made me appreciate how a well preserved book can continue educating for generations; that’s why libraries work so hard to preserve their collections. Andreas Dombrowskyj has helped maintain Columbia’s collection since 1961 working as a book repair technician in what is now the Conservation Department of CUL’s Preservation and Digital Conversion Division (PDCD). Andreas’ father, a history professor in their native Ukraine, advised his son to seek employment at Columbia once he graduated from John Adams High School in Queens, NY. Andreas was shy like me and walking into a harsh world as a new adult: America was in the early years of the Vietnam War, it was two years before Dr. King would give his most famous speech, and nearly a decade before we would land on the moon. The Rolling Stones would not even have their first hit for three more years. His father accompanied him to the campus to apply for a job, probably as nervous about letting his boy out into the world as my grandmother would be 20 years later, and he was immediately interviewed for a position in the Preservation Department. After providing a satisfactory writing sample he was hired to begin working just 10 days after graduating from high school in the spring of 1961. Andreas Dombrowskyj writing the call number on the spine of a new binding in the 1960s. His first duty was to write call numbers on the spines of books with black ink or white paint. Today we just scan barcodes to print call number labels. The department Andreas joined was going through a similar demographic shift as my childhood neighborhood, with a staff that shifted from many European immigrants to a significant number of Puerto Ricans in the 1960’s. Many had been factory workers that found the conditions of library work much more forgiving. Though they came from different cultures, Andreas got along well with his new coworkers and enjoyed the work. His good hand skills and interest in learning new things helped him acquire skills in book repair and bookbinding. He learned how to disbind books, clean them, repair paper, sew book signatures back together, and bind them in new hardcovers. His work and the work of the Conservation Department are vital to keeping our collection alive and supporting the wonderful exhibits and digitization projects that help promote our collections and give greater access to readers. I often send him rush items that are on reserve for courses that students need right away. A few months ago he was sent a book that needed a new cover, Studi Veneziani, from 1960. 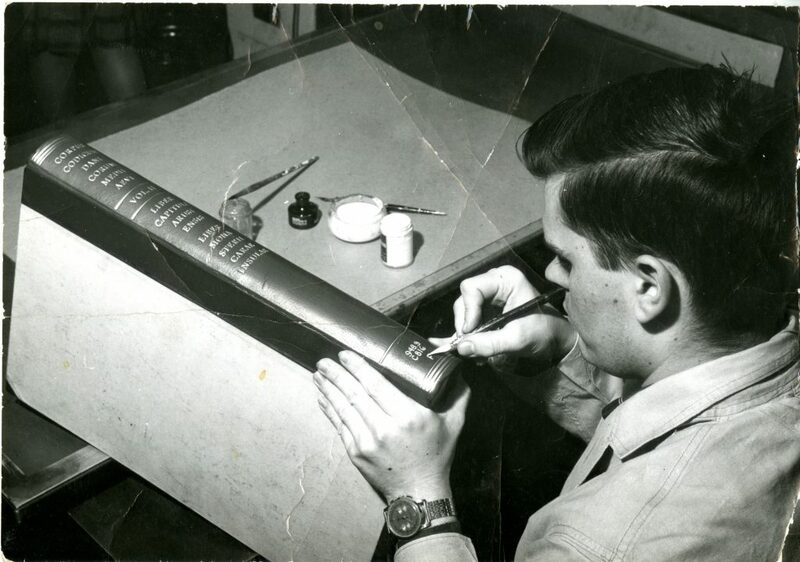 When he picked up the book to inspect the spine he saw a call number written in black ink in his handwriting from that first year on the job when he was just 18 years old. Since then we’ve had several more wars, our first African American President, we’ve landed on the moon, and somehow the Rolling Stones are still touring and having babies. The image shows the spine of Studi Veneziani vol. 2 (left), recently rebound by Andreas, and that book’s call slips pasted to the endsheet (right). The book’s original cloth spine, with the hand-lettered volume number and year written by Andreas in the early 1960s, was adhered to the new binding he made this year. At the tail is the new machine-printed call number label. On the right, the layers of call slips attest to the book’s usage over the past 56 years. This entry was posted in Preservation on August 20, 2018 by Freddy Claudio.